Brian Monaghan was a successful trial attorney in San Diego when he was diagnosed with melanoma that had metastasized to the brain in 1998. He was faced with a poor prognosis, and a virtual maze of treatment options, most providing little hope. His wife, Gerri, took on the oh-so-important role of being his advocate, researching her heart out, learning more about the disease than many physicians, and helping Brian survive this deadly disease. Now you may begin reading this inspirational story and say, "I don’t have access to these resources!" While it may be true that we don’t all have a friend with a private jet or know a physician personally who can help us, we all have resources - whether you know it or not. Gerri and Brian take you along on their touching journey, filled with humor and Brian’s incredible optimism. Throughout the book, they share how your resources may be strikingly similar to theirs. Did you know that many corporations volunteer to transport patients around the country for medical needs when their plane is not full? More than once I thought Gerri must have been a fly on the wall when I was providing advice to a newly diagnosed patient because her tips sounded so familiar. But, no, she worked hard to become the best advocate for her husband, learning these tips along the way. In this "resource manual", Gerri & Brian pass along advice and tips they learned during their cancer experience, in the hopes of helping other patients and their advocates on their journey. They cover topics like tapping into your own resources, researching the disease and treatment options, clinical trials, incorporating diet and complementary therapies and dealing with medical bills, among others. Think of this as a manual for patient and caregiver/advocate to take a sneak peak at what the other is feeling, but not always saying. Use it to help make the cancer care experience the best it can be for you and use Brian’s story of optimism to inspire your own! While this story is one battling cancer, these tips would be valuable to anyone facing a serious illness. 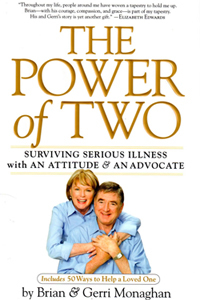 I recommend this book to anyone who is facing a serious illness or helping their loved one do so.